Declarations of Freedom is a new simulated experience patterned after Milestones of Freedom. It is a rich experience in which participants can become Founding Patriots! It will be tested in Spring of 2011 and ready to roll-out in Fall of 2011. Here is the overview! Get ready for an emotional experience that will rock your school, thrill your heart and give you hope for the future of America! This is an interactive simulated experience that staff and participants love! Participants are Continental Delegates with the quest to become FOUNDING PATRIOTS. Most people do not see themselves as active participants in the fight for liberty in America and have never thought of themselves as such. However, in order to preserve our liberty from one generation to another we must all become FOUNDING PATRIOTS to throw down tyranny and espouse principles of freedom. This event provides an opportunity for students to become Delegates to the Second Continental Congress on a quest to become FOUNDING PATRIOTS. It is an opportunity to “re-declare” our independence in the free land of America! 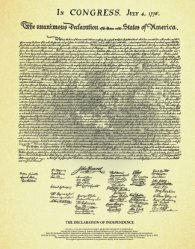 Volunteers and faculty become “Convention Officials” who explain the Declarations of Freedom and ask students to make the necessary freedom commitments before signing the Declaration of Independence. Teachers also administer the delegates’ convention briefing before the event as an in-class assignment. We define a FOUNDING PATRIOT as someone who loves the principles America was founded upon and who will work to keep America free! To recognize FOUNDING PATRIOTS your school is turned into Independence Hall complete with an interactive assembly, Declarations of Freedom, convention briefings, declarations of freedom and much more! Those involved will sense a swell of patriotism as they go through the requirements to become FOUNDING PATRIOTS. Before the day starts teachers are taken through an in-service training where they are given materials. Teachers administer a provided convention briefing to students to help orientate them for the event. On the day of the event delegates (students) come to an assembly and learn about the Second Continental Congress of 1776 and the events surrounding it. Then students are taken through the Declarations of Freedom (staffed by parents who become Convention Officials) where they make declarations of freedom in their official convention program. Upon completion of all of the Declarations, delegates return for the closing assembly where they learn about the risks and hopes the Founding Fathers expected when they signed the Declaration of Independence. Then students formally sign their own copy of the Declaration of Independence and become FOUNDING PATRIOTS. The event can be left up in the evening for a presentation open to families and members of the community too!